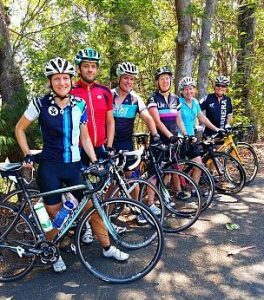 Get a group of riders together for an informative and ride changing weekend. Just to say a big thank you for your help in getting me to the start line confidently and more importantly to the finish line of the Gold Coast Peaks Challenge. Was a brilliant day and I loved every second of it. Weather was perfect. I completed it in 9.49 which I was happy with. I was completely expecting to do it just under 11. Thanks again for your help, I descended like a champion. Climbing and Descending and Cornering: Some questions and thoughts to consider. Are you frustrated and tired of getting left behind on the climbs? Have you considered it might be possible to go faster with your current fitness level? Climbing faster has a lot to do with body technique, your bike set up and your mental attitude. Descending faster comes with body technique, bike handling and confidence. Cornering faster and safer is a combination of technique, body language, timing, braking and choosing the right lines. This is a Road cycling camp. All riders must have a road bike with clip in pedal systems. 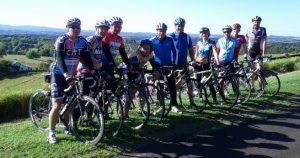 This special Cycling 101 Climbing/Descending/Cornering Camp is suited to almost all riders and abilities. We wait for any slower riders at the top of all climbs and regroup. 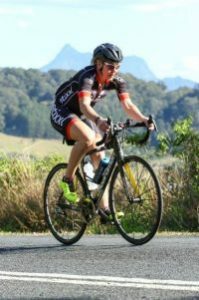 This camp intensive will address all Key elements and information and much more to have you going faster Up and Down without necessarily training more kilometres. The Camp focus is on solely on climbing short and long climbs in and out of the saddle and learning how to descend safely at speed. You will learn secrets gained from more than 2 decades of racing and training to give you the advantage in any situation. 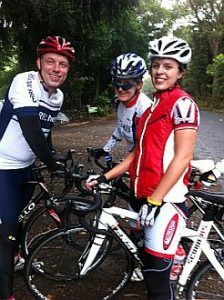 This camp will get you tuned up for any other hilly cycle challenge events and road/stage races. Please Note: This camp is for all levels of competitive fun sport riders and racers. 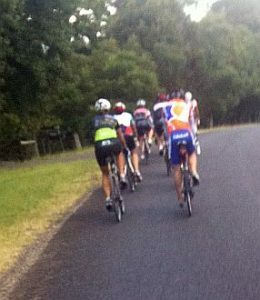 But all riders are expected to have some level of fitness and be able to currently average 22kph for a 3 hr ride (66k). The scenery is magnificent. Think country roads with little or no traffic. You will climb and descend inside the second largest Eroded Volcanic Caldera in the World through rainforests areas and small villages. 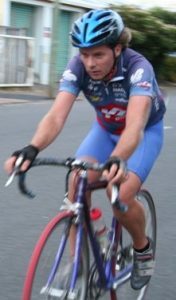 Anthony Mortimore is an ex professional road cyclist with 20+ years racing experience, including competing Internationally in North America/Europe for 10 years in more than 1000 events. 10 years on the professional cycle racing circuit (Pro cycling Tour) in Usa and Canada, including 5 USA Professional road cycling championships in Philli (50 times up the Manayunk Wall!). A mini season in Europe which included the major climbing events such as the Tour of Spain (Vuelta), Dauphine Libre, Midi Libre, Tour du laude and the Tour of Luxemborg. He has coached more than 300 riders over the last 7 years at this camp. Stay at camp headquarters. Mt Warning Rainforest Holiday park. Camping and cabins. Stay at the Mt Warning B and B Retreat which is 400m down the road. Cabins, Guest rooms, Garden Yurt. (02) 6679 5259. 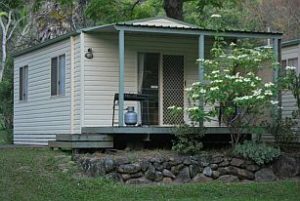 Stay in nearby at Mt Warning Forest Hideaway (on Byrrill creek rd) which is 14k from the start. 8 studio cabins. (02) 6679 7277. The camp meets for 2 days (Saturday and Sunday). Fee: Camp fee is $250. A $50 non refundable deposit is required to secure your space in the camp payable with credit card only through active network secure site . See link below. The remainder $200 fee is payable when we meet. Returning Campers? If you have done this camp before and wish to have a refresher, and/or gauge your progress since you last rode the camp. You are welcome to join us for a discounted Camp fee of $180. You will still need to register the deposit with the link below. 6 – 9 riders $225 each. 10 – 12+ riders $200 each. Once you have registered you will be emailed just before the camp dates you have chosen to attend with further information. Any questions email me anthony [at] summerofcycling.com with ‘Cycling 101 climbing camp in the subject line. Just wanted to say a HUGE thanks for a fantastic camp over the weekend. I am feeling more confident for 3 peaks Thanks so much for the riding plan for 3 Peaks. Thank you so much for all of that useful information and advice: will attempt to put it to good use. I really enjoyed the weekend camp, and your advice is much appreciated. Thanks again. Thanks for sending the old strategy message After having done the 3 Peaks ride once, I’m impressed at how accurate your suggestions are. I’ll be following them again, but this time I should be going into it a great deal stronger. I set a couple of PB on downhills here on Thursday, and close to a PB on the ascent, so the Climbing Descending camp has got my Mojo back. Thanks for the great training. The bike set-up was previously all wrong. It was like trying to ride up a hill on a Stair-Master, whilst towing the lounge and all the Bling don’t mean a thing, unless you have the right technique. Thanks for opening my eyes and sorting it out. Will certainly spread the word. Hope to come back again next year. Just a short note to say once again a big THANK YOU for the so very valuable tuition/time/bike set up. I think this course should be compulsory/essential to any one riding a road bike. You taught me so much in 2 days and I feel I learned so much and I am very appreciative for your support and feel privileged to have done this camp with you. After completing the climbing and descending course my riding has improved dramatically with no extra training! Anthony’s techniques for riding uphill have made climbing a breeze. I used to think I needed to add a few extra gears to my bike as I always ran out of gears. Now I rarely use the two lowest gears anymore! My downhill speed has also increased as I am a lot more confident going down steep and winding roads. Thank you so much for offering this course. I highly recommend it to any cyclist. I just wanted to say a big thanks for all the help and encouragement you gave me while on the 12 week training camp! It is amazing how much you helped improve my cycling! The time that I attacked and dropped you going down a hill… not that I’m competitive or anything! The subtle comment you made to “leave my three-ring bike at home.” This made me laugh- but I am so glad I did change! I’m just emailing you to say that your climbing camp was the best preparation for K1. I was not at all confident about getting up all of the K1 hills but I actually had no problems and never had to even consider getting off and walking (but some people did). I actually passed people on every hill. I started off very conservatively and still had lots left to get back to Thames. So next time I know that I could start off much harder. Thanks for your input and I think that my cycling has improved. Thanks for all your help on the camp. I have found all your tips and info to be hugely beneficial. Did you get down to Taranaki? Fantastic day and really good conditions. We both had excellent rides, trouble free and got with good bunches and hung in there. More than pleased with our times for 150km. Your training schedule had us for 5hrs15 and we both did 4hrs 38m (an awesome feeling). Christine finished 2nd in her grade so we have celebrated, your coaching has paid off for us both. After last year I was determined and we both felt really good throughout the ride although at times you wonder if you can keep the pace on, but we did. It really is worth all the effort when you finish feeling on such a high. I would like to thank you very much for the last climbing camp. I am more than convinced of the techniques, tips, general information you have given me will benefit a wide range of riders, as it has help me improve in leaps and bounds over a 4 week period. My best time up Wrights Rd before the Climbing Camp was approx 7:44, now 7:07, so that has a lot to do with your advice and tips. I Have really enjoyed the programme so far and feel I have learnt heaps which is already making a difference. I no longer hate hills! Thanks for your encouragement and support. I look forward to trying out wrights road again and beating my time. Riding continues to be fun and more enjoyable with the changes you suggested on the hills. Really enjoyed the course and you did make a difference. Thankyou for all your efforts with the climbing camp I enjoyed it very much and certainly gained a lot of excellent pointers and one or two very valuable lessons. Please keep in touch as I would be interested in participating in any future camps that you run. Hopefully when we meet again you will notice a big improvement in my riding style. I really enjoyed the climbing camp, learned a lot and had good fun doing it. I’ll be trying Wright Road every now and again to check progress! Just thought I would thank you for the camp I have found it very refreshing and professional. I will put it into practice over the next couple of months. Had a chuckle on the way home thinking about the Rabbit hill. Perhaps this year I will get out of the seat to climb it.